Show your child or grandchild they will always be your little sweet pea with this heartwarming board book filled with sweet rhymes and adorable illustrations that celebrates the deep bond between you and your little one. 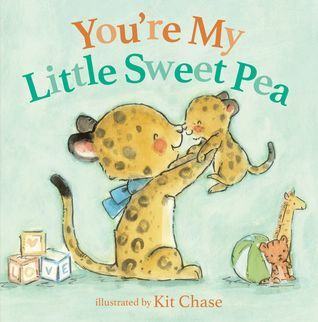 Featuring charming illustrations by Kit Chase of parent animals and their babies—kiss, cuddle, tickle, and rhyme your way through You're My Little Sweet Pea. This quick read is great for settling kids down for naptime or bedtime, and it is a great reminder to parents to slow down and just enjoy these precious moments with your little one. If you enjoy books from authors like Nancy Tillman (On the Night You Were Born) and Sam McBratney (Guess How Much I Love You), then You're My Little Sweet Pea is the perfect book for you. Provides unforgettable cuddle time for mothers, fathers, grandparents, and caregivers of children ages 0–4 years old. This is a sweet board book. Some of the illustrations are adorable. Board books are always my favorite for littles. This would be fun to read to your very little ones. This wasn't my favorite kids book but I think some parents would enjoy it. I recieved this book from BookLook Bloggers for free. All opinions are my own and I was not required to write a positive review.